Neon Crab Hamilton News: 2017 December Ink Buffet! Our all-day-deal year round is $700 and our gift to you for the holidays is taking $200 off of that! These book up quickly as each artist has a select amount of days available for buffets (and we have Christmas holidays during December as well). 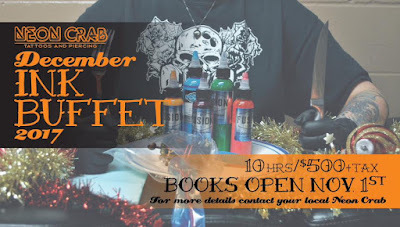 So save your nickels, $565 worth, and pop in after November 1st to book yourself an ink buffet!